Park-and-ride was the focus for two posts at Reinventing Urban Transport in May 2010. They questioned the wisdom of spending large sums of taxpayers' money to subsidize parking at urban mass transit stations, especially in places with high property prices. Below I have put the two posts together into one and edited a little. The team that helped me investigate parking policy in Asian cities in 2009/2010 found active park-and-ride programs in Bangkok, Beijing, Guangzhou, Hong Kong, Kuala Lumpur, Seoul, Singapore and Taipei. Park-and-ride facilities have been debated in Ahmedabad and Jakarta for their BRT systems. Delhi wasn't in our study but park-and-ride at Delhi Metro stations has been a hot topic there too. In many Asian cities park-and-ride is widely assumed to be a good thing almost by definition. This is a mistake. Proposals for park-and-ride facilities in dense urban contexts should be subject to more scrutiny. I am wary of park-and-ride. I think Asia's planners should be sceptical too. However, I can think of one kind of high-density neighbourhood which might be suitable for automobile park-and-ride. If a station area is overwhelmingly residential then park-and-ride can exploit the complementary timing of demand for home-based parking and park-and-ride parking. In other words, park-and-ride might be a cost-effective daytime use of residential parking that would otherwise have low-occupancy in those hours. This kind of park-and-ride would not need expensive purpose-specific facilities. Singapore’s park-and-ride program seems to be an example. Many of its park-and-ride site being located in its HDB public housing estates and are not specially-built as park-and-ride facilities. I responded to comments on the points above (some on the sustran-discuss list) as follows. The photos of Bangkok above are examples. These are in locations that are now considered to be [relatively] inner-urban. They are not in a low-density suburban context. Mumbai came up in the sustran-discuss debate as a case where these conditions do not yet exist. But they should be the priorities. They help everyone. The P&R strategy accepts defeat on these and undermines ever achieving them. For example, in Mumbai is it really so hard to imagine small premium buses (with premium fares comparable to autorickshaw prices perhaps) bringing middle-class people to stations of the Metro when it opens? Did you like this post? 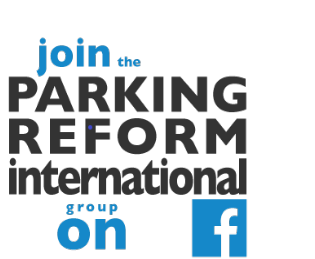 Then click here to get Reinventing Parking by Email!